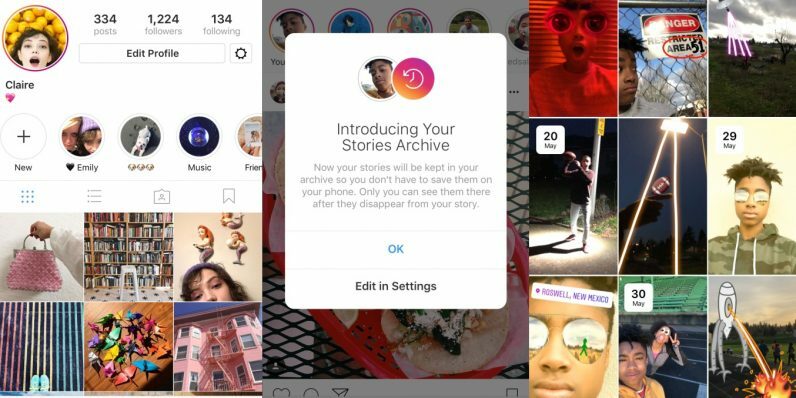 Instagram today announced two new features which change its popular Stories for the better. The first new feature is a Story Archive. As it sounds, the archive lets you save your past Stories beyond their traditional 24-hour expiration date. This was one of the features spotted by our own Matt Navarra among other beta features. Only you can see your archive, and you can turn off the feature if you want your Story to disappear as usual. To access the archive, click the clock icon in the top-right corner of the app. The other major update is Story Highlights, which lets you display your favorite archived Stories on your profile. You can save your highlights into individual Story reels which appear as circles on your profile. For example, if you want to share a series of Stories from a recent vacation, you would save them to your profile under the name “Sea Trip” or the like. Then, when someone visits your profile, they see it as one Story under that name. Each of the updates adds new appeal to Story content — not only does it give your Stories added value, but it gives you an additional way to spruce up your profile. I think there should be a way to integrate them into your main gallery, but that’s due to the part of me that loves the orderly grid. Both updates roll out today on the iOS and Android apps.